I bought this C-More to mount on my PCC. I haven't had a chance to use it yet, but look forward to using it in competition. Well it's a cmore !!! Great sight on my pcc. Got it on July 4th sale and have ran more than 2000 rounds so far and it's holding zero fine. Bought this to put on a MechTech pistol caliber carbine. I have used other C-More dots on my pistols and this seemed like a no-brainer. Surprise, it was perfect. 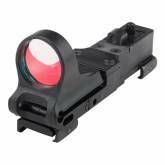 The carbine needs a quick acquisition sight and this one is one of the best. Put the stock on your shoulder, raise to your cheek and the dot is always easy to find. The large aperture makes all this possible.